Infections due to certain strains of Escherichia coli (E. coli) bacteria (normally a bacteria living in the intestines, and contained in feces) can cause severe, bloody diarrhea. The bacteria can spread from person to person on unwashed hands and surfaces, by swimming in contaminated water, and from touching animals at farms or petting zoos. Hand washing is one of the best ways to prevent the spread of bacteria through direct contact. People in Indonesia are not always aware of the importance of washing hands to avoid bacterial contamination. Children’s hands not being washed with proper soap after playing with soil and water increases the risk of E. coli contamination. We took the opportunity to sample children’s hands to have the opportunity to discuss the potential danger of E. coli contamination. This workshop aims to provide lessons to the elementary school students about the importance of hand hygiene in order to prevent E. coli bacterial contamination as well as the basic principles of E. coli bacterial determination on the hands by the method of Swab Test, the most commonly used technique to determine microbial contamination on surfaces including hands, utensils, working bench and soon. Know the importance of hand wash to avoid E. coli contamination, which could cause diarrhea. 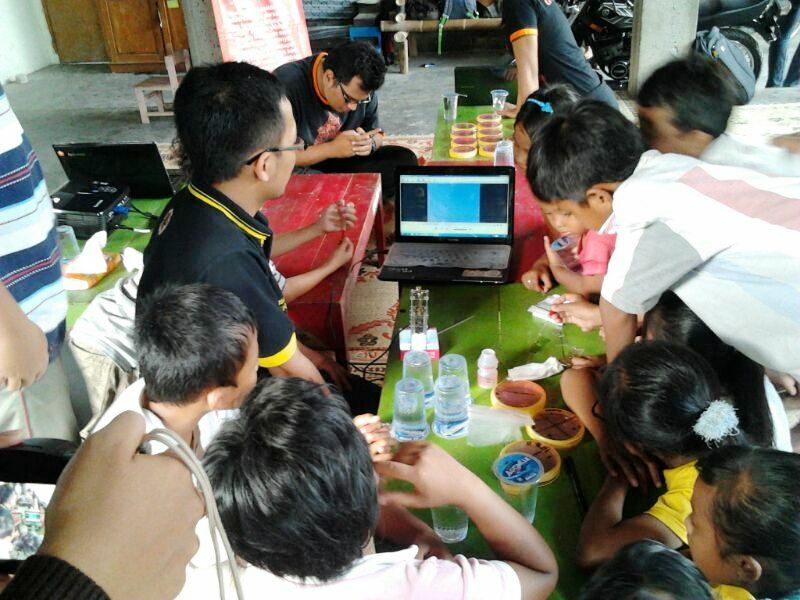 The workshop was attended by 20 children with their parents, but we only provided ENDO media for 15 people (15 petridishes) – the media differentiates E. coli (of coliform bacteria) vs other bacteria. We split each of the petridish into two parts to compare the following swabs: before washing hands and after washing hands. One of the prepared media was being split in to 4 parts to accommodate E. coli testing for 2 children who insisted their hands to be tested. At the beginning, most of the children were shy and scared to be tested. That was because we wore gloves and masks so they thought that they will be injected with a syringe. 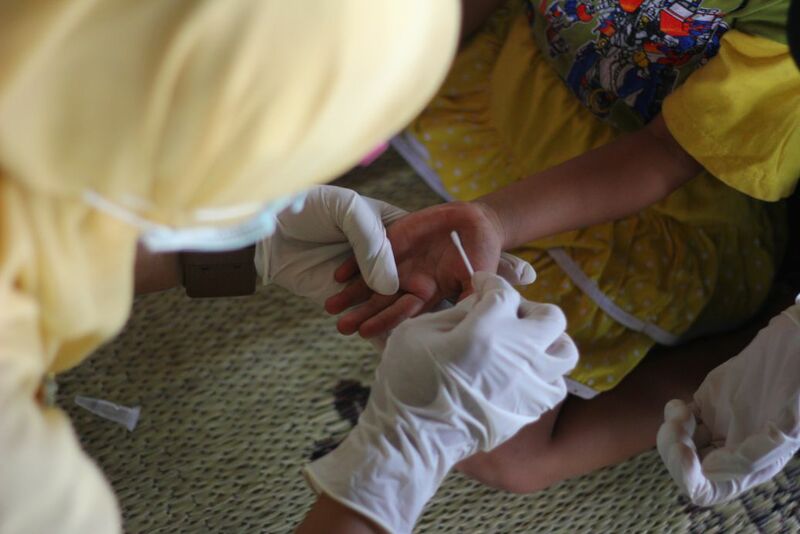 When we began to swab one of the children’s hand using a cotton Q-tip, he really enjoyed that and the other children wanted to be tested. While we wore masks and gloves for the analytical procedure, we did not wear gloves all the way during the workshop. We wanted the participants to feel comfortable with us. We also felt more comfortable if we tried to be as close as possible to the lab standard to provide more accurate results. Further, I read from the description in the ENDO agar media precautions that the media can be quite dangerous if we have direct contact due to Basic Fuchsin (a potential carcinogen), so gloves also protect the sampling personnel. 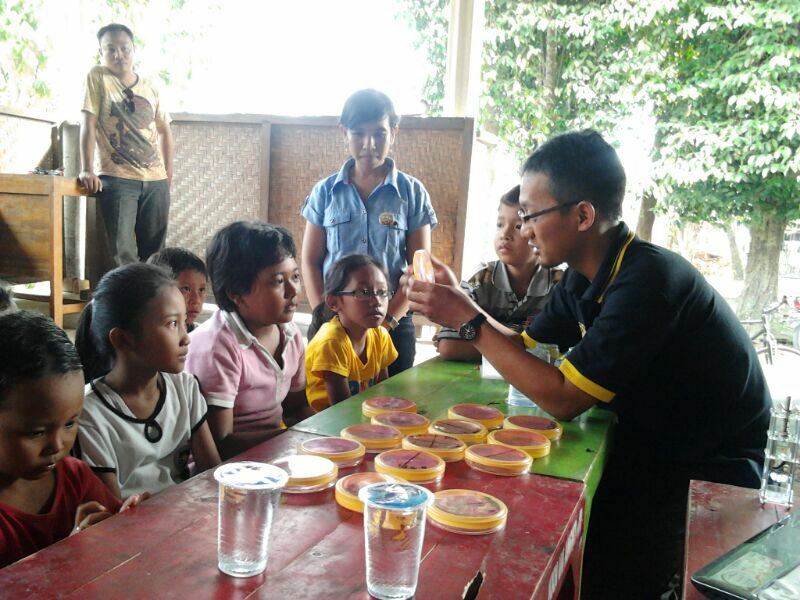 The sampling personnel at the workshop were junior students in the Agricultural Microbiology UGM Lab, so I felt responsible for their safety, as well as I wanted to show them proper sampling methods (close to proper at least :)). We can let go of lab procedures when conducting the test in field, however, only if it is really not possible to be done. I feel that if it is possible, then we have to try to carry it out. At the 2nd follow up workshop, we discussed the results of the swab test. 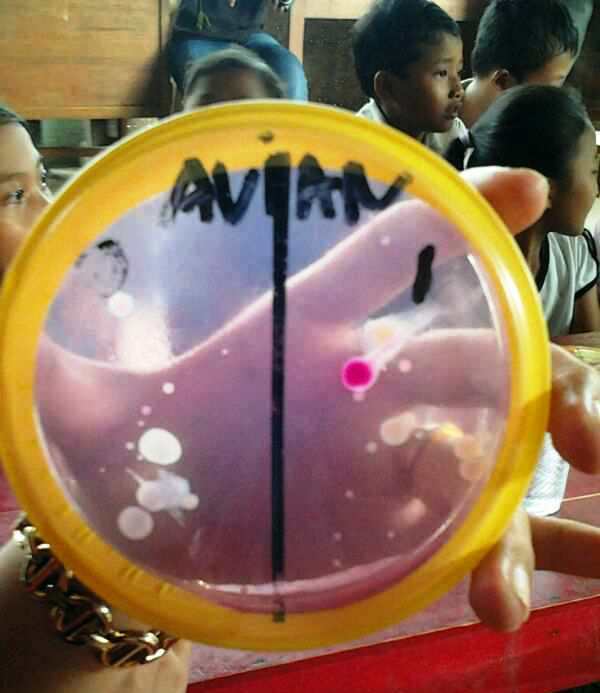 We had labeled the petridish with the names of the children swabbed, so we could discuss the individual results for each child. The swab test results showed that only two children have no coliform contamination after washing their hands, and one child shows positive for E. coli on his hands even after washing. The results suggested that the children did not wash their hands long enough, so we told them to wash their hands longer. The positive E. coli test result after hand wash also suggested that there was a possibility of E. coli contamination in the water reservoir. Now, with the community, we have ideas to carry out further E. coli tests in the water reservoir in the neighborhood. The workshop participants loved to see that there were people who wanted to carry out such kind of test in their community. It has never happened before in that area. They wrote up an article in their community page. At the end of the workshop, we also examined the river and pool water around the neighborhood using a webcam microscope. The children were very curious as they had never thought that there were so many microorganisms in a drop of water. This was an opportunity to suggest the children to always take a shower or washing after playing in the pool or river.